My stay in Muy Ne has come to an end. The last couple of days have been great as we finally found a way to move around the resort with an ecological and cheap mean of transportation: rented bicyles. They first costed us 30 000 Dongs (little more than a euro) for three hours from a guy offering them on the street. Later we realised that the rate from all shops around was 30 000 Dongs per day. That's what it is like to be a tourist around here. Eventhough I prefer to get good value for money, I realised by talking to our local guide that tourism is really helping people to make a living in Mui Ne. Without it, fifteen years ago, her family (of 2 parents and 8 children) did not have anything to eat other than sweet potatoes at all meals. Quantity was also less than required amount. With the arrival of tourism, people now have jobs. In that light, I don't mind paying a little more to contribute to the local economy. Tourists always pay more regardless. Locals are very cautious to not reveal what the local rate is for vietnamese people. As a rule of thumb, to bargain, I usually make an offer at half the price offered by the merchant, which he usually refuses and then slowly work the price up to two third of his initial offer while smiling and repeating « Ho Yé Makoi » (« It is two expensive). I also realised that it is better to know the tourist market price by asking around before making a decision to buy. Sometimes merchants really come up with hilarious prices. I finally gave up on kite surfing lessons and rented a winsurf instead – was great fun as the place gets great wind exposure and I have enough basics to enjoymyself and get a good work out. I still want to get around learning to kite surf someday though. -The white sand dunes at dusk: we watched the sun rise over white sand dunes that looked like the Sahara around 5.30am. We also sled down the dunes sitting on rented sledges made by locals. It was very similar to going down a green snow slope on a plastic bag except the temperature is about 20° at this time of the day. -The red dans dunes: just after the white sand dunes, we saw the red sand dunes which are smaller. Still very nice to walk around and we also saw a tiny scorpio. -The fishing village: on the road back to Mui Ne, we stopped in village that lies by the sea and got to see the work that these people do for probably very little salary: waking up at 4am (I could never be a fisherman) and coming around 9am to unwind their giant fishnets, tying up crabs with little yellow elastics, drying up fishes. They stop around 11am for few hours break before going back to it around 3pm until late in the evening. -The fairy stream: this is a little river in Mui Ne itself that we would never have found ourselves. It is a beautiful walk upstream walking in orange and white sands carreers and discovering the wild life. It was so beautiful, I would love you to see it! Unfortunately, both William and me ran out of camera batteries at the white sand dunes. No pictures but great memories for sure ! Well that's all for this post which has been longer than usual. I am now sitting on a « sleepers » bus waiting to arrive in Nah Trang, working my way up the vietnamese coast. 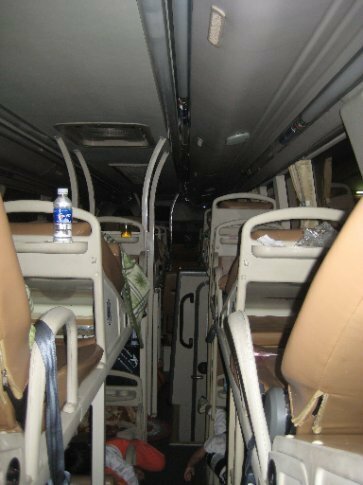 You can see what such a bus looks like from the inside at the beginning of this post. William has left to Saigon and will be back to Switzerland for Christmas. It has been great travelling with him as well as seeing him again. He has been a great host and a great companion. I am already looking forward to seeing him again. In Nah Trang, I will meet a new friend I met in Mui Ne who ges by the name of Jobst and comes from Germany. Very cool and friendly guy, I had great fun sharing a few beers with him two days ago. There's an endless debate about tourists paying more than local rates to "help people out". I think you just end up pushing the inflation, making life very difficult for those who do not work in the tourism. You better paying the correct price, and give some money to a local charity. I can see that you trip is a great experience and that you enjoy it. I am looking forward to hearing and seeing more about it. Vietnam is definetly a country I have to visit. If you go through China, come at Beijing to say hello to us.